It’s not a matter of surprise to know the data files stored on your MS Outlook can blow-up anytime. Your emails are stored locally on your machines, including the offline storage folders (Yes, you read that right). Outlook uses an offline folder (OST file) to allow its users to work offline, even if the Outlook program gets disconnected from MS Exchange Server. The OST file is a synchronized copy (cached Outlook items) of the account saved on your machine. Here’s the default location of the OST file: drive:\Users\\AppData\Local\Microsoft\Outlook. Corruption is a common problem with Outlook data files when any unfavorable circumstances happen inside them. When the dialog box appears, click ‘Clear Offline Items’ option under this dialog box. On Outlook 2010 ribbon, select Send/Receive option. Click Update Folder to save the changes. OST Integrity Checker (scanost.exe) or Inbox Repair tool (scanpst.exe) is the native solution provided by Microsoft Outlook to fix minor glitches of Exchange OST files. The Scanost.exe tool allows the users to scan and compare the discrepancies of mailbox items of OST files present on Exchange Server and MS Outlook. This inbuilt tool helps the users to manually fix the minor corruption issues, present in the OST files. Unfortunately, the OST Integrity Checker has been discontinued in the later versions of Outlook (including 2010 and higher versions). However, you can use the Inbox Repair tool to repair errors of OST and PST files in the later versions of MS Outlook. Able to fix only minor corruption problems. Unable to recover missing emails, items from OST file. Not present in Outlook 2010 or higher versions. No safety assurance while recovering the data. As Microsoft Exchange Server uses offline data file (OST), which is a copy of information stored on email server. If somewhere you encounter issues with the OST file, then you can delete the existing one, and re-create (download) that again from the server. However, use this procedure wisely, only if your OST file is not usable anymore. A large size OST file may cause various troubles, such as OST corruption, sluggish Outlook performance, etc. And deleting some of the items may be not a successful technique to decrease the increasing file size. When you remove an item from Outlook folder, then it still remains in the deleted folder. Deleting the item from ‘Deleted Items Folder’ will permanently remove it from OST file, which is losing your valuable item. Another alternative to it is to compact the OST file. The OST file items are stored in such a way that they may occupy additional space and unusable for other purposes. When you compact OST file, then it reduces that extra space, occupied by the OST files. You can turn off the antivirus software, and other firewall settings, as some programs (like Outlook), are designed to scan and detects problems for every incoming and outgoing email. An enabled Antivirus setting may block the normal functioning of the Outlook at times, so you may try to disable the settings and restart Outlook to see the changes. At times, corruption is unpredictable in Outlook data files that can restrict the user to perform normal functioning. The native solutions aren’t a successful approach to completely rely on to deal with OST corruption problems. 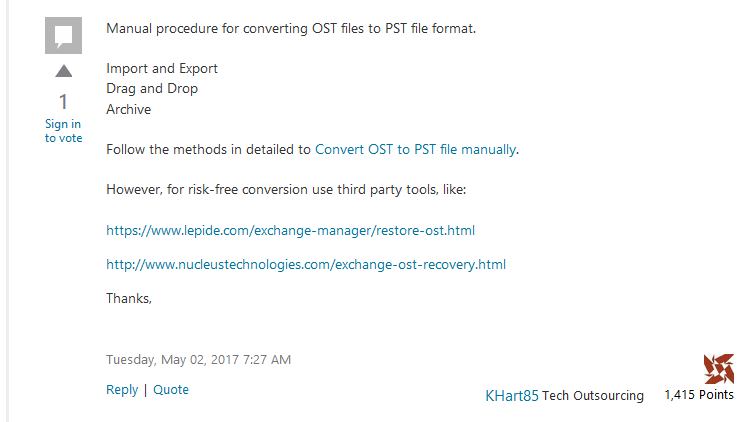 However, third-party OST solution uses safe, secured, and swift method to recover severely affected OST files and convert OST to PST file, immediately.